THE COMMUNITY coat rack in Chichester has been so successful it is due to run past Christmas. Supported by the Chichester Post, the coat rack held under the arches at the Assembly Rooms in the city centre has seen hundreds of coats donated and collected by those in need. 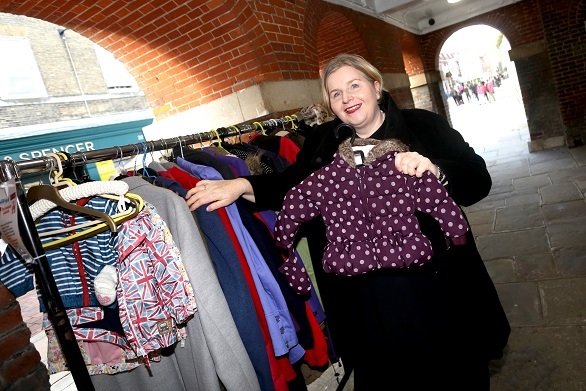 The coat rack is the brainchild of businesswoman Donna Ockenden, who also runs The Chichester Four Streets Project – a charity which helps the city’s homeless. The coat project was set up after Donna saw the idea happening in other cities. Donna knew she would always ensure her children had a warm coat but it wasn’t always possible for everyone. The community coat rack has already been in the city centre for the past four weeks this year and Donna said the people of Chichester had been incredibly generous. “After four weeks, there is no sign of supply and need reducing,” she said. “Every day, the turnover on the coat rack is huge and the one we put away each night is almost completely different to the one we put out in the morning due to the supply and demand. “The coat rack is not staffed so we don’t count them, we just rely on people’s kindness and judge the amount going and coming by the empty hangers and looking at how different it is every day. Donna is asking anyone who wishes to donate a coat to make sure it is in a condition you would wear yourself. Any coats left over at the end of the project will be given to a good home. “Our plan was to leave the coat rack up for around a month depending on the interest,” she continued. Donna has said that the coats are not just there to help the homeless, but are available to anybody struggling to make ends meet. The coat rack is set up under the arches at the City Council house in North Street and will be there all day up until 5pm for anyone wishing to donate or take a coat.